Founded in 1934, William Hill is one of the most trusted brands in our marketplace, attracting millions of customers from around the world. William Hill is a very respected name in the always growing gambling industry. Despite being old-timers, they are constantly trying to stay fresh by improving and developing their products. One of the most recent gems coming out of the William Hill team is esports betting. It’s a pure joy to get in on the eSports action at William Hill. The smooth layout together with their attractive selection of eSports games makes for a delightful experience. In addition to that, new players receive a juicy welcome bonus that will get you rolling in no time. The long-time player favorite William Hill is a safe and reliable gambling operator. And whoever signs up are guaranteed to have a blast. They provide a bunch of different eSports games, welcome bonus offers and promotions to loyal customers. Overall a satisfying stay, and lots of products to enjoy; Sportsbook, Casino, Live Casino, Games, Scratchcards, Poker and more. The team at esportsbets24 have been using William Hill for years. And we must say that we applaud their new eSports section, they’ve done an excellent job putting it all together. Check them out and get your bets ready! To stay at the top, betting sites must offer that little extra something. William Hill does just that; they offer one of the most lucrative welcome bonuses on the market. William Hill awards all new players with £20 FREE bets if they place a bet worth of £10. However, remember that wagering and terms apply. Get hold of this sweet deal by 1. Sign up using promo code F20, 2. Bet! Place a £10 eSports bet, 3. Enjoy your 2x£10 Free bets. Simply a too good of a promotion not to claim. You must stake a minimum of £10 on your first bet. Customers using Skrill, Skrill 1-Tap, Neteller or PaySafe to deposit will however not qualify for any free bet sign-up offer. Applies to new accounts opened in the UK only using GBP currency. Please note that the bonus offer may vary depending on where you live. Some players might receive a larger bonus than the mentioned above. For instance, players from Sweden get a super generous 100% welcome bonus up to 1000kr. Just make sure to double check what the particular deal for your country is. Members at William Hill stays satisfied. As their impressive selection of eSports will keep any bettor busy. This fantastic company provides daily odds for all leading eSports games as of today. You get to place bets on CSGO, League of Legends, Dota 2, Starcraft 2 and Heroes of the Storm. William Hill does a tremendous job of covering exciting eSports leagues and tournaments. William Hill also spoils their members with thrilling Live Casino games. Try your luck at fast-paced video slots or show your patience at a Black Jack table. There are plenty of world-class live casino games that will guarantee a pleasant time. William Hill welcomes you with open arms; as a new player, you’re awarded £25 in bonus money to get you ready for the world of live casino games. 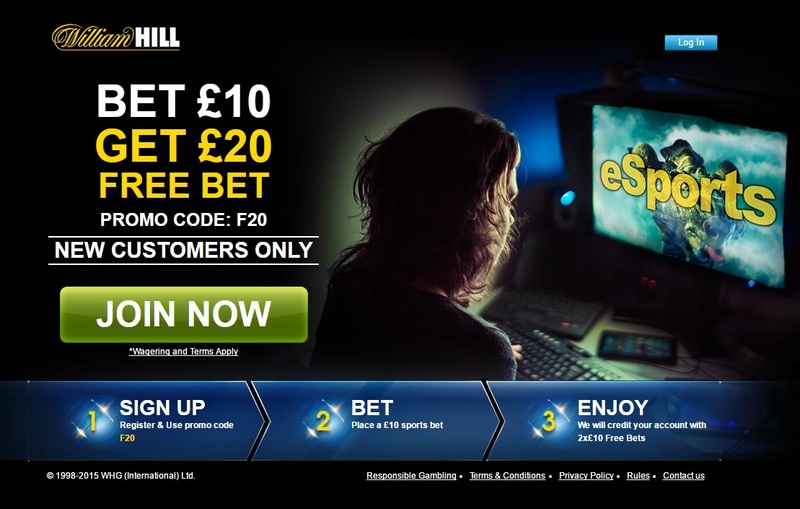 Dominating the traditional sports betting industry obviously wasn’t enough for William Hill, they had to crown themselves kings of eSports betting as well. With the variety of games offered, it’s clear that William Hill aims at becoming one of the leading brands of the eSports gambling industry. The eSports games selection alone is without a doubt a valuable reason to become a member at William Hill. But it’s not the only way they stand out; they also treat new customers with excellent free bets and deposit bonuses. Players based in the UK get £20 worth of free bets if they stake a minimum of £10. Not based in the UK? Don’t worry; you’ll get your fine share of a bonus as well. William Hill offers loads of promotional deals for countries all over the world. There are a bunch of daily matches available for the biggest eSports games; League of Legends, Dota 2, CSGO, Starcraft 2, Overwatch and Heroes of the Storm. 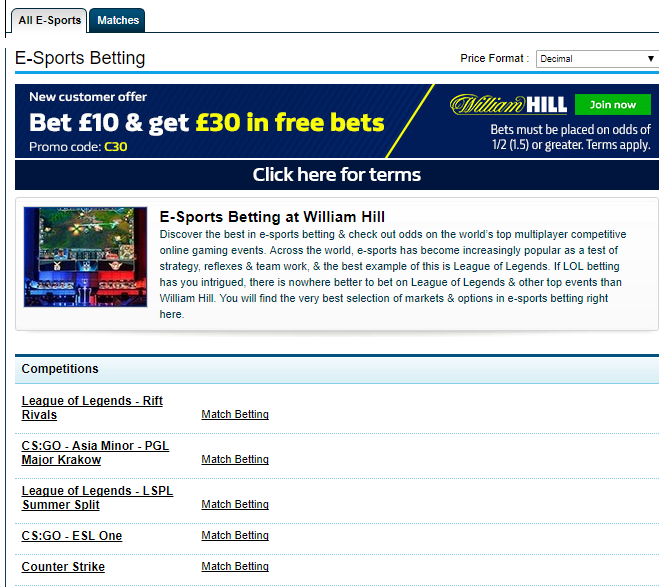 We’re sure that William Hill will add even more eSports markets in the future. And possibly extend the odds on certain eSports by making it possible to bet on First Kill, Correct Score and so forth. Traditional sports betting is clearly William Hill’s home turf; they’ve earned bragging rights for offering markets on more than 60,000 football matches a year. Other sports include Baseball, Basketball, Boxing, Tennis, Golf and lots more. So if you ever want to mix it up and bet on traditional sports instead of eSports, William Hill’s Sportsbook surely won’t disappoint. Their massive sports selection delivers first-class entertainment and boosted odds on all the key sports events. They’ve done an outstanding job on creating a perfect variety of sports markets. William Hill also provides their customers with a service called “Tip Advisor”, which is awesome if you ever need guidance on how to become a winning bettor. Another cool feature is William Hill’s radio/podcast. The podcasts contain information that can be beneficial, such as statements from expert commentators. Imagine how great it would be with an eSports podcast hosted by the likes of Thorin and Richard Lewis. Who knows, it might just happen if eSports keeps growing. Be part of the nail-biting excitement of sports live betting at William Hill! Once you’ve tried it, you’ll want more. Nothing beats the satisfying feeling of placing late-in-game bets and suddenly grab hold of huge winnings. There are endless possibilities with in-game odds, and skill is a vital factor. Analyze the game you’re watching and place in-game bets accordingly to your conclusion. William Hill excels in offering live betting to their members. Unfortunately, we can’t find any available eSports matches for in-play betting. But given their history of wanting to stay ahead of their competitors, we should expect a rise of in-play eSports betting on their platform soon. The current state of the eSports scene is definitely ready for live betting. eSports Odds are generally well-suited for in-play bets, such as; Correct Score, First Blood, Map Win and much more. William Hill could very well become one of the absolute top bookies if they add eSports live betting. However, they’re already a great contender, and customers won’t be let down by Hill’s eSports section as of today. Choose from a wide range of quick and secure payment methods. William Hill processes domestic and international card transactions with Visa, Mastercard, and Diners, and with virtual cards from EntroPay. Minimum deposit by Credit and Debit Cards is £5. Members can also make deposits to their William Hill accounts by using E-Wallet. So what is an E-wallet? It’s a super secure system that stores your payment details for multiple payment methods and websites. E-wallets are great if you for some reason don’t want gambling sites to get a hold of your credit card details. Instead, you’ll only fill in your E-wallet e-mail and/or username. Available E-Wallets: Skrill, Pingit, PayPal, NETELLER, WebMoney, Yandex Money, QIWI Wallet and moneta.ru. Minimum deposit by E-Wallet is £10. William Hill also accepts Online banking deposits. And the minimum deposit using this method is £10. Several online banking services for each country are available, so you’ll notice once you join if your preferred method is listed. 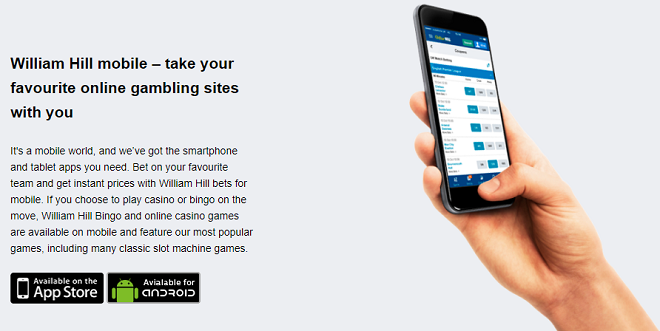 William Hill is a mobile friendly company, and you can easily access their website directly from your device’s browser. All you have to do is; visit their site, sign up and make a deposit. And if your account has been credited with a free bet (promo code F20), the option to redeem it will appear at the bottom of your bet slip. William Hill is also fully compatible with Apple devices, so you’ll be able to place eSports bets on the go. Just head over to App Store and download the William Hill Live Sports Betting App. The app is available in following languages: English, German, Greek, Japanese, Russian and Swedish. Remember to use the promo code F20 to access their awesome free bet offer. When you bet £10, you will be credited with £20 in Free Bets (2 x £10 Bets). There’s really no reason to wait, join one of the best betting companies in the world and get started with eSports betting today!